What I am about to share with you is a bit of an industry secret. But what I want you to really grasp is that this system will work for just a few cuttings, or in our case we do tens of thousands of cuttings at time using this very simple, yet incredibly effect system. Water as Needed and Only as Needed, Automatically, even while you are away. 26,000 rooted cuttings waiting to be potted. In the above photo there are approximately 26,000 cuttings that we stuck this summer. 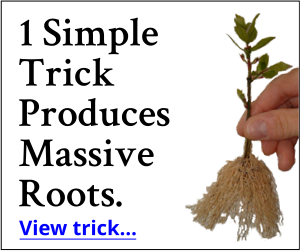 The rooting process is being controlled automatically with a simple system that can be used to root as few as 10 cuttings at a time or as many as tens of thousands at a time. People in the industry all use the same system, we just expand it as needed. Expanding the system as needed can be done in a matter of minute. It is amazingly simple. In a moment I will explain more about the system and how it works and why it is incredibly effective. But first I need to explain something about cuttings. For the most part cuttings come in three flavors. Okay, not flavors but stages. For all practical purposes the plant propagation season begins in May or June, depending on where you live. If you are in a colder northern state, zone 6 or below, the season begins no earlier than June 1st. A good target date for northern states would be June 15th. In warmer states, zones 7 and up, you can usually get started around mid May. But no earlier. During the summer months we do what are called softwood cuttings and they root easily and fast. During the late summer and fall the cuttings are harder and are referred to as semi-hardwood cuttings. During the winter the wood is very hard and those cuttings are called hardwood cuttings. So what does all that mean? Softwood Cutting, Hardwood Cutting, what’s the Difference? There are two differences. One has to do with timing, what time of the year did you take the cutting? And second difference is the actual consistency of the cutting that you take. Which is really determined by the time of the year. Let me explain it this way. Picture in your mind, or actually hold in your hand, a yellow, #2 writing pencil. How would you describe that pencil? It’s yellow, it’s about 7″ long, it’s made of wood and it’s filled with graphite. It is very rigid and if you tried to bend it, it would snap in two. That’s how a hardwood cutting is. Very rigid and you were to try and bend it, it would break. A softwood cutting on the other hand is soft, pliable, flexible and can be bent without breaking. A softwood cutting is like partially cooked spaghetti. If you hold it at the bottom it will stand on it’s own, but it can be bent without breaking. Arborvitae cuttings being watered automatically. When Rooting Cuttings, Timing is Everything. For all practical purposes lets say that the gardening season begins in the spring when the new leaves begin to emerge on the dormant plants. Once plants start to grow in the spring they grow like crazy for about four to six weeks. Then they slow down. First to appear are the leaves and immediately following the leaves are new stems, or the new growth for the season. It’s an amazing thing to watch and most people don’t even realize how much their plants are growing or how interesting the process is. But you will now! The New Growth is Where You Will Take Your Cuttings From. However, you cannot be too impatient, you have to allow nature to take it’s course. You have to allow that new growth to harden off a bit. Not so much that it becomes hardwood or semi-hardwood, but just hard enough that when you take the cuttings they don’t immediately fail. If you take the cuttings too soon they will limp over and die within hours because the wood is just too soft. Remember, write this on the top of your foot; “Timing is everything”. So from the time you see the first leaves in spring, count forward on your calender six weeks and write in big bold letters on the calender; “Start Taking Cuttings”. Here in northern Ohio we typically see that burst of new leaves around mid April. That means that our earliest date for taking cuttings is June 1st. That date, whatever it is for you, is the beginning of Plant Propagation Season. That’s when you take your very first softwood cuttings and you can just keep right on taking them all summer long and into fall. Eventually those cuttings will harden off and become semi-hardwood cuttings then hardwood cuttings. Doesn’t matter, just keep right on taking those cuttings. Now Here’s the Kicker about Softwood Cuttings. 1. They root faster and easier than any cuttings you can take all year. You can take that to the bank. 2. They will die faster than any cutting you will take all year if they are not happy. You can take that to the bank as well. So how do you keep them happy? I’m glad you asked and I’m about to show you some magic. Seriously, this really is like magic because it works incredibly well. What we as plant propagators have learned is that if you can keep a softwood cutting moistened, it will be happy and if it’s happy it will make roots as fast as nature allows. We wet the cuttings with just a short spritz of water, then we allow them to dry, then we spritz them again, allow them to dry then spritz them again. It’s super easy to do because we automate it with just a few fairly simple doodads that do all of the work for us. I just turn it on and let it run. We use these flat head spray nozzles that are specially designed for outdoor use. They deliver a pattern of water that is almost perfectly horizontal. The water is atomized, but only to a point. What makes these nozzles unique is that the droplets of water are tiny, yet just large enough to not be easily carried by the wind. Other nozzles don’t work because all of the water just blows away. As you can see, all of the cuttings are getting wet, but not too wet. As soon as they are wet enough the water shuts off and only comes back on when necessary. That’s why this system is so efficient. Remember how I said that the system is expandable? As soon as we make our first batch of cuttings we install one spray nozzle. One nozzle can easily water hundreds of cuttings. We just keep sticking cuttings in the bed and as soon as we get out of range of the first spray nozzle we add another. It only takes minutes to install each spray nozzle. If one spray nozzle is all you need, that’s fine. The system happily runs one nozzle. The spray nozzles plug into plastic PVC piping that is hooked to a garden hose. The water is turned on and off automatically, as needed, by an automatic water valve which is controlled by an electronic controller. The controller is mounted inside of a garage or shed and plugs into a regular household outlet. Of course the outlet should be a GFI type of outlet for safety reasons. The automatic valve can be out in the weather and is low voltage, 24 volts, and connects to the controller with light weight wire like household thermostat wire. The controller automatically turns this system on in the morning, automatically waters the cuttings throughout the day as needed, then the system shuts down in the evening so the cuttings are nice and dry by the time the sun goes down. It’s an amazing thing to watch. All you do is set it and walk away! I set my system in June on the first day that we do cuttings and just let it run! After that all we do is keep making cuttings, sticking them in the bed and adding spray nozzles. I’ve been sharing this information with my customers for years, those who buy my Backyard Growing System, and they all get frustrated because they can’t find the components needed to set this system up. So what I am doing, at least for now, is selling all of the critical components along with an Instructional YouTube Video that shows you how to set up the system and how to actually use the system and make the cuttings. But I am going to be honest with you. Even for me, these components are hard to come by. When I have them available I offer them for sale. But so far it has been frustrating trying to get my hands on this stuff. Like I said, this kit comes with all of the critical components, the things that you cannot find locally. You’ll still have to pick up a few things at your local hardware store like a section of 3/4″ plastic PVC pipe, a couple of PVC fittings, about three brass fittings, and a piece of thermostat wire. In the Instructional YouTube video I explain to you, and show you exactly how to assemble the system in great detail, how to set the controller, what the proper settings are, how to glue the PVC fittings onto the PVC pipe, how to connect the wiring etc. Then I show you how to make the cuttings, how to stick the cuttings. It’s all very simple with this system if you are willing to make the investment. These are the components included in the kit. The kit includes one of these automatic water valves. You only need one. I do tens of thousands of cuttings with just one valve. Like I said, one horizontal spray nozzles will cover an area large enough to stick several hundred cuttings. In the kit you get four of these nozzles. The automatically controller is the most critical component. Most controllers on the market are completely incapable of controlling the water as we need it for this application. This one works incredibly well. And of course you will be given access to the PRIVATE Instructional YouTube videos which contain a great deal of information that I am not sharing here. We put a lot of time into making this YouTube video because I did not want to leave anything to chance, or leave anything misunderstood. There are lot of really important tips and examples in this video that I have intentionally not included on this page. New YouTube Video Just Added to this Package! “Simplifying the Art of Growing Plants for Profit”. This is a brand new video that we just shot this February (2014). There is so much conflicting and confusing information when it comes to plant propagation that we recorded this private video to completely simplify the process of exactly which plant propagation techniques you should be using to make the most money with plants as quickly as possible, in the easiest possible way. I’ve been teaching this stuff online for over 15 years now and in that time I’ve shared a plethora of plant propagation techniques. They all work, but there are only three that I use. In this private video I explain why, what they are and how to use them the most effectively. This is good Stuff! So far feedback on both of these private YouTube videos has been nothing but positive. You know me, don’t expect some fancy Hollywood production. Because if you do, you’ll be sadly disappointed. What you get is me walking you through the complete process just as if you were standing there with me in the barn. I didn’t get all dressed up like on TV, I’m wearing my bibs and knowing me I probably made no effort to make sure they were clean. As a matter of fact, now that I think about it, at one point in the movie I’m wearing a bandana and sweating like crazy because I was out back working and Amber said: “Mike, we have to shoot video for the propagation kit.” That’s how it happens around here. Work, work, work, stop and make a movie, get back to work. If you find that unappealing then please don’t order. I will tell you this. Of all the cuttings that we do, and we do tens of thousands each year, 95% of them are done during the summer when it’s nice outside using this very system. We do a few hardwoods during the winter, but all the rest are done using this system because it works! and you can order by clicking this link. Please indicate in the note section which product you would like to purchase and include your email address to receive the instructional videos. Questions? I’ll tell you right now, don’t ask for brand names, model numbers etc. I am not going to share that nor am I going to answer questions that are propitiatory regarding information contained in the private video. I really put this together for serious propagators only. Everything is about Arithmetic, which goes like this . . .
Grow and Sell 350 Plants to Pay for this System. Grow and Sell 60 Plants to Pay for this System. Only $297.00 for the Kit and access to the 2 PRIVATE YouTube videos.